Why do people still turn their noses up when you mention that you are a wrestling fan I mean people don’t act the same way when you say you like football, baseball or even when you like a certain TV programme. Is it because most wrestling shows are under the banner of sports-entertainment? and not Sport or either Entertainment and as a result is frowned upon by each for not belonging to either genre fully. You ask a sports fan, why don’t you like wrestling? You’ll get the usual response of “It’s fake right?” - Right in the same way many players and Governing Bodies haven’t rigged the game in which you surely love. You ask a movie or TV programme viewer why don’t you like wrestling? “It’s not entertaining or again, it’s fake yeah” - Yeah same way the characters Made in Chelsea or The Only Way in Essex and The Avengers are the real people. Fake /feik/ - not genuine; imitation or counterfeit. The facts - Wrestling shows are not legitimate contests, even stated by wrestlers and promoters themselves and while fans will scream and cry “It’s real to me damnit!”, the events witnessed by fans are purely entertainment-based on storyline’s, with the majority of matches being "scripted" or "choreographed" previously. Even the Godfather of Wrestling, not the one that was in the WWE Attitude Era played by Charles Wright, but Vince McMahon publicly acknowledged this in 1989 to avoid taxes from athletic commissions and since the birth of Wrestlemania in 1985 WWE has acknowledged their product as sports entertainment that is based in competitive sport and dramatic theatre. However, everything that a trained wrestler does in that ring from the routine moves that fans are accustom to; like a bodyslam or even irish-whipping your opponent into the turnbuckle CAN HURT, but when you take into account a highflying move like Shooting Star Press or a high impact move like a PowerBomb, if not done correctly the worst can happen and serious injuries may occur. Everything they do in that ring has to be believable, they have to make you believe that what they are going through is happening. The pain, the arrogance, their cruelty, and their happiness, everything they do must inspire you to become more involved in what they do. Yes actors can do that too, only during the period of that movie or show through, but what wrestlers do is take it to another level, they are in your face, they are live and you invest yourself in that moment into living your dreams through them wither they succeed or lose. You either want to be the bad guy (not always Razor Ramon) beating up that smiling do-gooder or the good guy who beats the bully who had to get beat sometime. So when it comes to people saying it’s fake or not legitimate ask those people to go to a training school or ask them to ask a wrestler to perform a move on them I'm pretty sure they will see things very differently by the end. Then on the other side of the coin, Newspapers, Businesses and may other outlets tend to see all wrestling promotions as a backyard or amateurish operations almost disreputable in many ways something that is just a damn right lie because they aren’t and as such won’t advertise, use posters or associate them with them in any way. Let’s use WWE or World Wrestling Entertainment as an example, it has stated on it’s website that it’s a publicly traded and privately controlled entertainment company that deals primarily in Professional Wrestling. 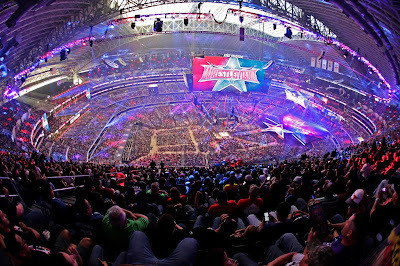 However, thanks to global expansion and by that I mean other sources of income from different avenues of entertainment, that being is film, music, product licensing and direct product sales, WWE has found a way, a smart way that is, to see the bigger picture and realise pro wrestling can be more entertaining and profitable than two men or women who have trained their whole lives to entertain the fans in the ring until the victor stands tall. Now here’s something as all wrestling fans (and pretty much anyone else) know WWE is the largest wrestling promotion in the world, there is no doubt on this one, it is. The promotion currently holds over 300 events out of a 365 calendar year, broadcasts to around 36 million viewers in more than 150 countries and I haven’t even mentioned the WWE Network. For years mainstream publicity has ignored or mocked wrestling for everything mentioned above, only to include it in big stories when sadly someone dies or when there is a scandal and then it becomes news. Now again using WWE, it is not often you’ll see the good things that a Wrestling Company does on the news or in the newspaper but for over thirty years WWE has been in partnership with the Make-a-Wish Campaign also, that Triple H and Stephanie McMahon established the non-profit charitable organisation, Connor’s Cure and WWE is a sponsor of the Special Olympics since 2014. It makes you wonder that even when the biggest wrestling promotion in the world strives to help charities even they are barely mentioned in the news what chance does other small promotions have. Now that was WWE, events closer to home in the UK have shown the wrestling promotions have gone out of their way to improve the image of wrestling making it more exciting, more relatable to fans, appearing on TV programming and assisting in charities whenever they can. Case in point, Progress Wrestling and their fans supported Cavendish Cancer Care with donations of £640 donation a recent shows, Insane Championship Wrestling hosted ICW: Afternoon Delight last year to mark the re-opening of the Clutha Vaults Bar in Glasgow and all proceeds from that event went directly to the Clutha Trust and Alpha Omega Wrestling run regular shows at the Winter Gardens in Morecambe, with proceeds from the shows going to the restoration of the grade II listed building. My point of the article this one thing, many people’s image of wrestling is wrong, I’ve listed many reasons why that is but only way the perception of that image can change is by fans saying to newspapers or TV stations saying we want to see wrestling on mainstream TV, I guarantee much like BBC1 was inundated with demands to see more from ICW, following the broadcast of both Insane Fight Club documentaries, but with family-friendly and adult orientated shows available across the UK everyone could see them on a suitable time-slot, but again it can only happen with the fans support. Photography credits to David J Wilson and Tony Knox.